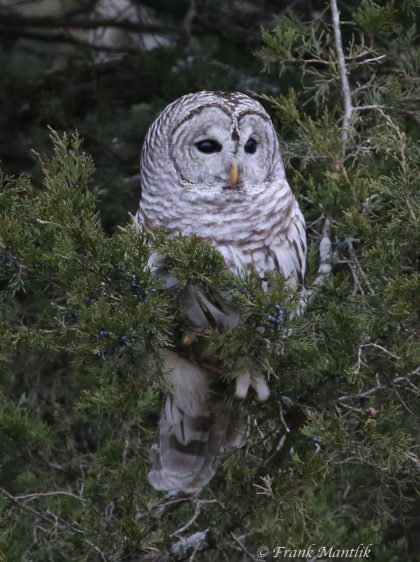 Why are so many people seeing Barred Owls this winter? 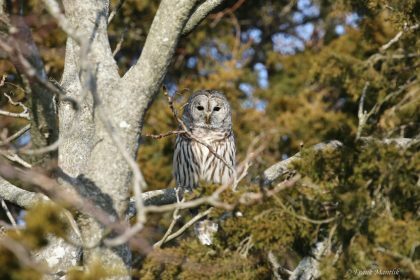 There seems to be reason to think that contrary to what we speculated – namely that so many owls are being observed this winter because an abundance of rodents last year led to a highly successful owl breeding season – barred owls are actually hungry and searching for food because there are so few rodents. “I too have been seeing lots, mostly roadkills, and it got me thinking about rodent abundances. We have been doing lots and lots of small mammal trapping the past years and this year is a down year after two banner years in 2016 and 2017. There were white-footed mice everywhere. I think bird of prey abundances built up over the past couple years and now with this poor rodent year we are having this year, they are desperate for food and are hunting roadside, being dumb, and hunting during the day. Driving around the state I am seeing dead owls and hawks everywhere. “The graph (right) is based on our trapping effort, which has been pretty substantial, netting us a low of 314 captured mice in 2013 to a high of 1003 in 2016. Anyway, thought you might be interested. Feel free to circulate. “Success” is defined at the mice caught/trap night. For instance in 2017, we had 797 mouse captures over 2,268 trap nights = 35%. 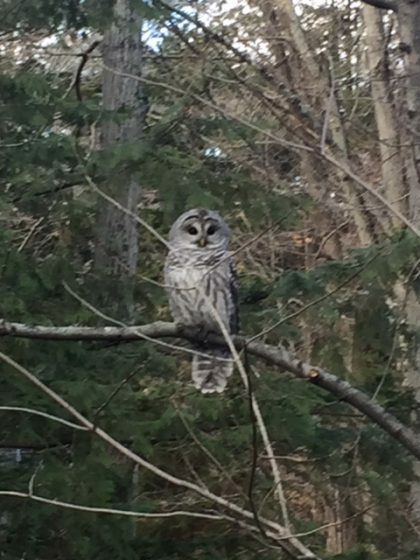 “This past spring, I saw no signs of larger than normal barred owl broods and no signs of large numbers of prey. 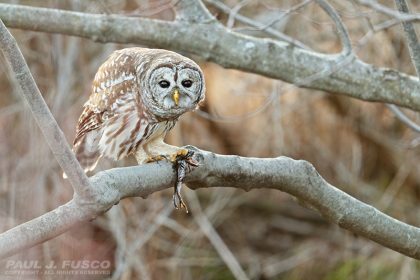 Birds are up to 50 percent or more of the barred owl’s prey base. The storms and heavy rains of spring and summer caused many raptor nests to fail and surely caused the same problems for passerines. “While barred owls use side hollows in trees most of the nests that I have found over the years are crotch hollows not visible from the ground. I have seen in the past these hollows flooded and eggs lost so it is likely that a lot of barred owl nests failed last spring. “I would also think that the rains flooded fields and woodlands reducing meadow vole and white-footed mouse production. I certainly had no luck live trapping meadow voles for use in my raptor traps. “In any event, this winter there are no cedar berries, there was virtually no mast crop, berries in general are low, and the cone crop was light. Bird populations seem to be low (my three worst Christmas count tallies). Meadow vole and white-footed mouse populations also appear to be low. “All the birds with the exception of the last two intakes (occurring this week) have been well-fleshed. This is the time of year we start seeing birds that are thin, so that is not an uncommon finding. Most of them are young birds, presumably not hunting well due to lack of experience. This holds true for the hawks seen at this time of year also. “In the 35 years I have been doing rehab I have never seen this many Barred Owls, although they have always seemed to be the owl I have received the most of. I do believe there is a rise in the population and therefore an increase in the number we are seeing injured. Also since the fall, the majority of the Barred Owls I have received are young first year (now last year’s) birds. Perhaps it is two-fold the reason they are being seen more. With the increased population they have to move further out to hunt and establish territories. If indeed there is a lack of food base also, this would also cause them to be more visible. The last time I remember an increase in the number of Barred Owls hit by car was about 2 years ago when we received many snow storms that added up to a lot of deep snow. It seemed then the owls took to the roads to hunt, finding it easier than hunting in deep snow. “These mostly first-year owls are coming in underweight, so they are having a hard time finding food. And due to the light acorn crop and berry production this year, prey is scarce. They are eating voraciously here. And we are getting a lot of calls from people who see them out during the day, worried that they are injured because they don’t immediately fly away when approached. Often when animals are hit by cars it is secondary to an underlying condition affecting coordination and/or searching for food near roadways. 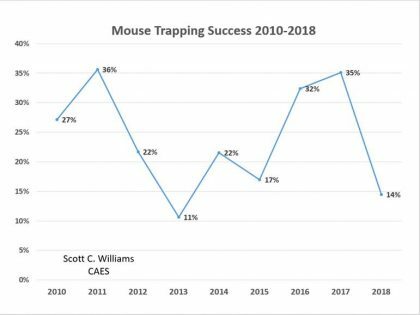 Scott Williams’ graph showing the trend in mouse trapping. Paul J. Fusco contributed this recent photo of a Barred Owl eating a wood frog on an unusually warm winter day. This photo and the one below, taken in New Canaan and Milford, are courtesy of Frank Mantlik, a member of our Coastal Center Regional Board.